Well, I started my Latifa scarf about a week or so ago, and I am loving it! Sure the garter stitch is boring as all get out, but the yarn is so soft I hardly care! Haha! It is knitting bliss. I’m using KnitPicks Andean Treasure for the color blocks, and some Morehouse Merino in a varigated oolorway for the ruffles. I might actually do a ruffle or two before I get to the end, just to break up the monotony. I know I probably should weave in the ends as I go, too… but don’t we all hate that part? I’m just hoping all those ends don’t delay me in finishing this beauteous scarf! I don’t know about you guys, but I’m not tired yet of looking at this hat! Once again, it photographed more blue than teal, but the shade is very lovely. 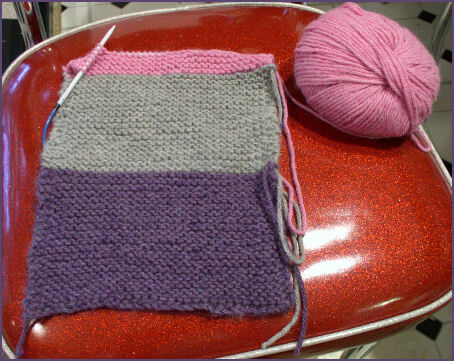 I toyed with doing a hat band of the blue and green yarns that made up the shade in some sort of color block pattern, but in the end I wasn’t happy with that so I settled on this gray yarn and I’m doing a mistake rib pattern to give it some texture. I likey! Of course I find knitting the hat bands to be quite tedious, but I do think they add something to my finished product so that’s why I do them. I think this is turning out to be my favorite hat so far. Next I want to learn entrelac so I can do some sort of entrelac pattern on the crown section before the decreases… but I’m getting ahead of myself. There’s still the matter of Alison’s poncho, of course. 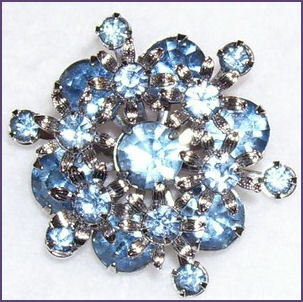 And then I bought this lovely pin from an Ebay seller today, and it’s going you-know-where… on Diane’s hat, of course!! The original pin I had purchased a long time ago turned out to be “too green” for the job. Perhaps I will find another project that suits that one well. 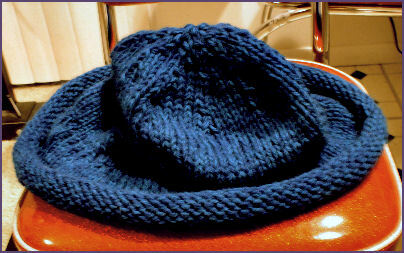 But I hope the pin gets here soon so that the hat will be completely finished. And, yay! I actually got it done before winter is over. 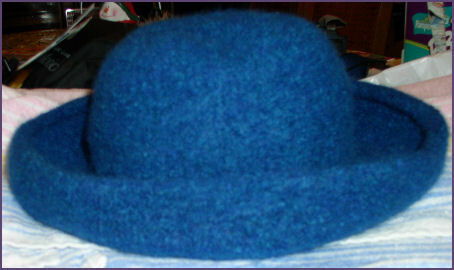 Well tonight I did several rounds of felting with Diane’s hat. It’s looking good! I ran it through the washer twice, with Diana’s help, since I can’t reach the washer, but then tossed it around by hand in a sink full of hot water for a while. I was at first concerned that it might be too big, but I think it’s taking shape nicely. We’ll see after it dries! I may try hand felting more often. For me, at least for now, it’s a bit easier than dealing with a washer I can’t get to that’s always full of laundry anyway. I hope my cousin Diane will like her hat! 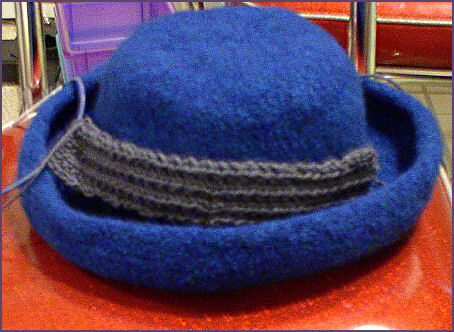 It’s a Fiber Trends AC-1 Felted Hat, made with Knitpicks Wool of the Andes, in two colors, “Storm” and “Winter’s Night” held together. In all of the photographs I’ve taken of the hat so far, none has fairly shown the deep shade of teal that this hat really is. Well, now that the hat is done except for felting, I thought it would be a good time to go back and pick up Alison’s long-suffering poncho. I hadn’t touched it since before my dad died, and the last time I was working on it, I was in the middle of threading a longer cable needle through the stitches. 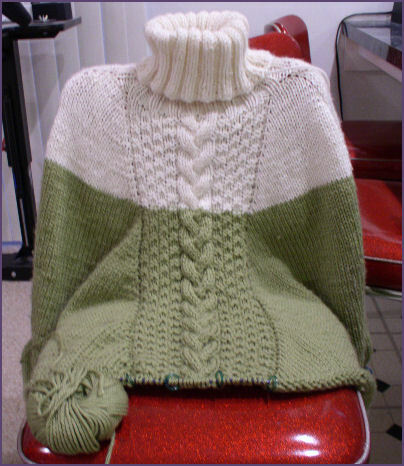 Believe it or not, I have one 52″ cable and one 40″ cable connected together in my Denise Interchangeable Needles, and the bottom of the poncho is spaced comfortably around. This thing is HUGE! Hopefully I’ll be finished with the poncho sometime soon, especially sometime before ponchos are all the way out of fashion again! So, how is this for justification? Because Alison’s poncho is so large, I need a small project to take in the car, right? Sure, I do! I discovered the Latifa scarf on Knitty recently, and I just have to make one! For the color blocks I chose several shades of KnitPicks Andean Treasure, and for the ruffles I picked a varigated yarn from Morehouse Merino Farms in the “Berry” colorway. 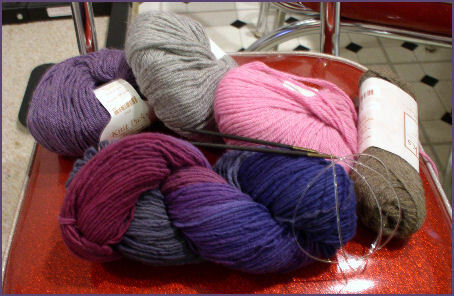 All of these yarns are so soft; I can’t wait to cast on! I think this will be my car knitting for some time to come. The only thing I am not looking forward to is weaving in all of the ends that will be generated by each color block plus each ruffle. So I hope this doesn’t turn out to be yet another doomed project. Wish me luck!! DH’s snoring got me up at 3:30 this morning, which made me extremely tired for today, but hey, at least I got the hat done! I even weaved in the ends as it came off the needles, which is a task I usually postpone. We’ve got a mountain range of laundry to get done this week so I don’t know when it will be before I cna take custody of the washer for felting, but hopefully it won’t be too long. I’m trying to decide now if the hat band I’m planning to make should be smoky gray as originally intended, or whether I should take the greenier shade from the hat itself and make a band from that. I guess I’ll wait and see how it looks after felting before I decide whih color would go best. Anyway, just had to share my first nearly FO of 2006. See What a Little Grounding Will Do? Well, let’s just say that my 9-year-old is going to have a little extra time on her hands over the next two weeks. So, today she picked up her knitting again, and finally knit past the point where she stopped and we had to rip back last fall. She even snapped this photo herself with her very own digital camera, which she received for Christmas this year. She asked tonight if she could start her own knitting blog, which I think might be an interesting idea, because we’ve been struggling with her writing assignments all school year. But I’ll have to figure out a way to do it that will maintain her safety and security. 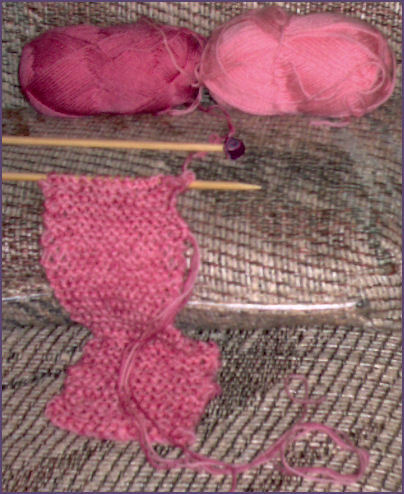 I’ll think on it… and meanwhile, the pink scarf’s finally gettin’ longer!